Beautiful Secluded Cabin in the Woods! 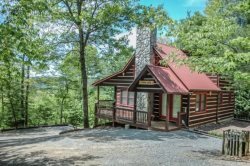 Woodland Retreat is the spot, sitting on a private lot with lush woods you will feel yourself relax instantly by the sounds of nature surrounding you. This beautiful 3BR/3B home has granite countertops throughout, stainless appliances and beautiful custom tile showers. The kitchen is a fully equipped for the family cook. As you walk into the open living, dining kitchen area of the home with a beautiful stone, wood burning fireplace and a massive wall of window’s the stress of daily life will disappear. Exhale and take in the view. From the main level of the home you can access the large screened porch with wood burning fireplace (firewood provided) and ample of seating. Grill a steak on the gas grill and sip a glass of wine while you watch the embers of the fire. From the dining or living area you can access the large upper deck of the home that sits in the trees like a bird house. The view of the fall foliage is breathtaking. The Master Bedroom, located upstairs, has a king bed and en-suite bathroom with a Jacuzzi tub and custom tile shower. The main level bedroom has a king bed and access to the main level bathroom with a custom tile shower. The lower level bedroom has 2 full beds and access to a full bath with a shower tub combo. Step downstairs to the game room with beautiful leather seating, a large flat screen TV, Pool Table and Game Table. Walk onto the deck for an afternoon siesta in the hammock or unwind from your day of adventure in the hot tub all while sitting in the trees. This is it, this is the place! We didn't forget the luxuries of home, WiFi, Washer/Dryer, Satellite TV, Dishwasher and of course a fenced area for your fur babies. Don’t miss out on the many unique activities and outdoor experiences North Georgia has to offer. Meander the streets of Blue Ridge where you will find one of a kind shops, breweries and eateries. Take a ride on the Blue Ridge Scenic Railroad, Hike the Appalachian Trail, Visit a waterfall or the swinging bridge, Tube, Kayak, Paddle Board or White Water Raft the Toccoa or Ocoee River’s. Go boating on Lake Blue Ridge or step back in time and watch a first run movie at the famous Swan Drive-In Theater. And of course Mercier Orchards is a must. There is always a festival or event happening here in the mountains. Beautiful cabin and location. We had a great weekend. Will definitely be back!! This is truly the best cabin I have stayed in. SOmeone has put a lot of thought into every detail. I would definitely come back. Screened in porch was awesome. How the lights were labeled- Loved it!! This cabin was great! The pictures do not do it justice. It is nicely decorated, clean, and has lots of amenities. We especially enjoyed the outdoor fireplace. We plan to come back and will certainly recommend it to friends! Cabin was fantastic! We enjoyed our stay, the amenities were fantastic cabin was beautiful, the area was serene and peaceful!! Would recommend and stay again!! We had a wonderful time with friends to bring in the New Year!! Beautiful cabin! !